Days after he met heads of many opposition parties, including Rahul Gandhi, Andhra Pradesh Chief Minister N. Chandrababu Naidu Thursday met Prime Minister H.D. Deve Gowda and his Karnataka counterpart H.D. Kumaraswamy and said it was necessary for all opposition parties to join hands to save the country and institutions from destruction. Aiming to forge an anti-BJP front ahead of the 2019 Lok Sabha polls, Naidu alleged that every institution, including CBI and RBI, had been destroyed by the BJP-led NDA government. "It is our responsibility to join hands together to save and protect this great nation and also save democracy and the Constitution," he told reporters after meeting Deve Gowda and Kumaraswamy here. Naidu hinted that the 1996 model of forming the government with Deve Gowda as prime minister with outside support of the Congress, could also be one of the experiments to form the government at the centre. "PM candidate, we will decide. All of us will join together. First our aim is to protect democracy and save nation. What I am saying is, Congress is the main and major party. If you see only one experiment, that is under Deve Gowda's prime ministership. At that time, the Third Front had come to power. "Then we had take support from Congress from outside. That is the only experiment... " he said. Asked whether he was refering to 1996 model of forming government, he said, "I am interested in the nation and consensus. Everybody will join together. There is no organisation as of today. I have taken some initiative and I am meeting everybody. After that, we will meet and decide how to go about." Echoing similar views, Kumaraswamy said the prime ministerial candidate could be discussed later, "but at this point of time, the focus is to unite the opposition and save democracy." He said a mega farmers rally would be held in December or January. "I plan to hold the event by December-end or January (next year). All regional leaders, with the exception of BJP, will be invited," he said. Flaying the BJP-led NDA government, Deve Gowda alleged the NDA has created problems by destroying various institutions of the country. "It is the responsibility of all secular parties including the Congress to come together to oust the present government," he said. The meeting came amid the ruling Congress-JDS coalition winning two out of the three Lok Sabha seats and two assembly segments that went to bypolls in Karnataka on November 3. The BJP had managed to retain Shivamogga Lok Sabha seat, but lost Ballari, a bastion of the BJP and Reddy brothers. Naidu, who had last week met heads of several opposition parties, including Rahul Gandhi in New Delhi, had termed his party's alliance with the Congress a "democratic compulsion" to protect the country. 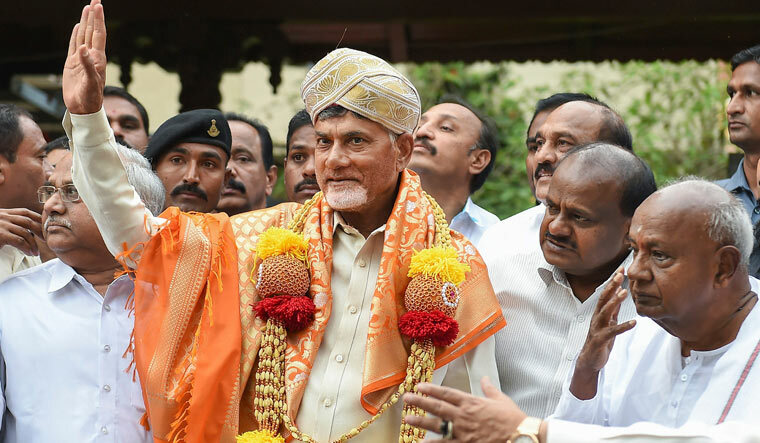 Naidu Thursday said the prime ministerial candidate would be decided at later stage, but at this point of time, it was necessary for all opposition parties to unite together to not only save the country, "but also save institutions from destruction by central government." "It is an initial exercise (of bringing opposition parties together). After that, we will work together," he said. He said West Bengal Chief Minister Mamata Banerjee and Kumaraswamy were holding rallies in January. "These things are happening. How to work out the unification of the parties and how to go about thereafter, we will all see in course of time," he said. Lambasting the Centre, Naidu alleged that it was using CBI and income tax departments to "control opposition," conducting raids "indiscriminately and harassing politicians, which people have been witnessing even in Karnataka and Tamil Nadu." Such raids also have been conducted recently in Telangana, Uttar Pradesh and Bihar besides Gujarat, he alleged. "Even as these raids are taking place, Prime Minister Narendra Modi is not making any statements," Naidu said. "Besides, destroying the insititutions, the Indian economy is in doldrums as demonetisation did not have good effect on it," he said. Petrol prices have been increasing day by day and rupee is also depreciating, he added. Launching a tirade against the BJP-led NDA government, Naidu alleged that the party had betrayed the Telugu Desam Party (TDP) in Andhra Pradesh as it did not confer special status for AP. The TDP broke away from the BJP-led National Democratic Alliance in March this year.